Your device can be very easy controlled using Motion and Gestures. 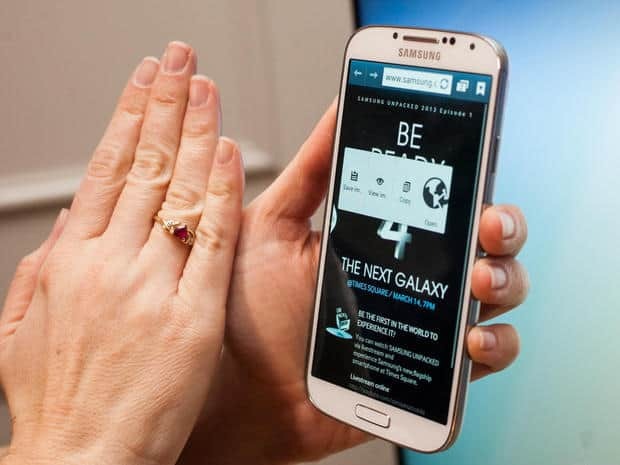 The Motion settings let you control your Samsung galaxy S4 with natural movements, or touching and moving the screen. If you want to access the motion settings, you will have to enter the Menu, tap on Settings, My device and then Motion and gestures. Tap the slider button and turn it from Off to On. You will discover three different types of motion and gestures. If you want to make a Direct call when viewing a contact details, message details, or call details from the log, you will have to place the device to your ear to initiate a call to the contact or phone number. The Smart Alert feature will let you know about your missed calls or messages when you pick up your phone. If you want to Zoom, you will need to touch and hold two points on the screen when viewing a picture or a website, and tilt your device back and forth to zoom in or out. You can Browse an image when you are viewing a picture while zoomed in. You will need to tap a point on the screen and move your device up, down, left, or right to pan around the image. Also, you can Mute or Pause your phone if you turn the device over when you have a incoming call or listen to music. You can Capture screen by swiping the screen from right to left with the side of your hand. Also, you can Mute or Pause Media playback or the Radio by covering the screen of your phone with your hand. If you feel that your sensors aren’t reacting very good to your actions, you can calibrate them. So, you will Tap on Gyroscope calibration and then Calibrate.